We recommend that parents check the products used with their children at www.SaferProducts.gov for recalls and injury reports. In addition, parents should report problems with a product both to the manufacturer and to CPSC at www.SaferProducts.gov. 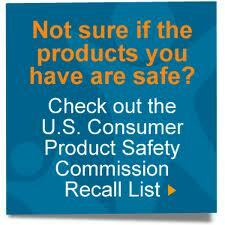 Hundreds of products are recalled by the U.S. federal government each year. If a product is recalled, it must be removed from store shelves, but often recalled products can still be found on the second-hand market or in homes. If you have a recalled product, carefully follow the government’s instructions, which could require you to stop using it, repair it, or return it for a refund or replacement. If you receive hand-me-downs or buy children’s products at second-hand shops or yard sales, check past product recalls to make sure new-to-you items are safe. Be particularly careful about cribs, bassinets or play yards that have been recalled. They are the only places children can be left alone for long periods of time, so be sure they are safe. Visit the U.S. Consumer Product Safety Commission for a complete list of product recalls, including household products and appliances not specifically related to children. To register your car seats for automatic recall notices, visit the National Highway Traffic Safety Administration. Other agencies also issue recalls. To find out about them as they happen, sign up to receive e-mail alerts directly from the federal government’s recalls.gov website.